Those who travel frequently on business are all too familiar with the stress they encounter. Everybody knows that there are a number of health concerns associated with stress such as weight gain, an increase in blood pressure, etc. 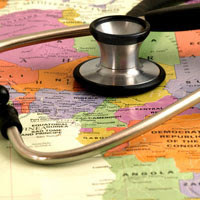 However, it may come as a complete surprise to many that travel is also responsible for quite a few medical problems. The biological clock tends to get completely disrupted when you travel across various time zones. When this happens it can affect the quality of sleep negatively and you can feel tired and as if you have been deprived of sleep for a very long time. You can expect your mental alertness to be diminished and your ability to perform tasks that require mental performance is likely to be severely impaired. In many ways, your general level of alertness and performance is similar to that of individuals who are intoxicated. According to doctors conversant with jet lag symptoms, the best way of overcoming it is to regulate the circadian rhythm of your body by sticking to the routines that it is used to. This may mean that if you work out every morning after getting up, you need to keep on doing it even when you are traveling and are in a different time zone altogether. Sticking to a normal daily routine is among the best ways of countering jet lag. When you travel frequently you are exposed to individuals and environments that have germs that your body is not immune to. As a result, there in an increased chance of your falling ill. Your immune system is also weakened by sleep deprivation and fatigue and you are thus more susceptible to infections. You can, to a certain extent, safeguard yourself, by washing your hands frequently as also by wiping down armrest and tray tables of the plane. Make it a point to always keep hydrated; drink only bottled water to ensure that you don’t have a tummy upset. Also, an increased level of hydration keeps your nasal mucous from drying out allowing you to ward off germs better. Sitting for long durations in cramped and poorly designed airline seats can cause your body to become stiff; this can be extremely painful. Since the seats generally have very poor lumbar support there is every possibility of you developing musculoskeletal conditions. The situation is aggravated even more as the seating position does not allow you to put back your neck and head leading to a creation of anterior head syndrome. You can place a pillow into the lower back curve behind the upper back so that your head can stay in contact with the headrest. Doing this will also push forward your shoulders while encouraging your neck and lower back to follow their natural curves. The chance of stiffness and pain will be greatly reduced. You should also consider performing some simple stretches of the hand and ankle as well as bending down at the waist and flexing your legs to offset the stiffness associated with long periods of inactivity. If you travel frequently on long-haul flights, you have a significantly increased chance of developing blood clots in your limbs. The hazard is increased greatly if you suffer from obesity, are genetically predisposed or if you are undergoing hormone therapies or taking birth control pills. A good way of fighting this is to stand up and take a walk down the aisle of the plane every half an hour or so to keep your blood circulation from getting hampered. A business executive who needs to travel extensively. An avid wildlife photographer, she has visited Tadoba a number of times. Visit Tigers Heaven Resort to see some of his recent shots of the local wildlife.